Once upon a time there was a Bihari boy called Madhav. He fell in love with girl called Riya. Madhav didn't speak English well. Riya did. Madhav wanted a relationship. Riya didn't. Riya just wanted friendship. Madhav didn't. Riya suggested a compromise. 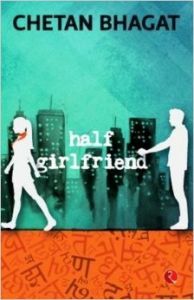 She agreed to be his half-girlfriend. From the author of the blockbuster novels Five Point Someone One Night @ the Call Center The 3 Mistakes of My Life 2 States and Revolution 2020 comes a simple and beautiful love story that will touch your heart and inspire you to chase your dreams.